I would say my list from last year could easily be repeated/continued, except for #14, which I accomplished and have absolutely no intention of doing again. This has been making the rounds on the internets, and I think it’s lovely. 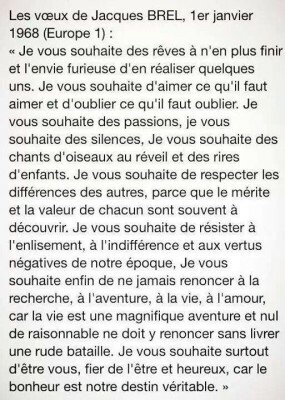 Apparently, these were Jacques Brel’s New Year’s wishes for 1968 and they are just as suited to 2017. I’m too lazy to translate them for you, so if you can’t read French, it’s time to learn. Always keep New Year’s resolutions. Get up early and get right out of bed and meditate for ten minutes before starting day (but only after coffee). Am already doing that this morning. Cut down on wine intake, no matter how stressed I am. Find other ways to handle stress, such as herbal tea. Do something creative/career-oriented every day, and not just watch old episodes of ’70s TV shows on YouTube. Be more patient with other humans and also with myself. Be less of a ridiculous person. Don’t buy any more lipsticks/lip glosses until have used up all the ones I have, which are myriad. Remember I am lucky to be alive and healthy (touch wood). Be a better girlfriend to Significant Other, who puts up with me for reasons I will never understand. Help as many animals as I can. Try to be as vegan as I can. Read Finnegans Wake (and don’t put an apostrophe in the title, even though I really want to. Joyce wanted the title that way, and yes, I realize it means something). Fight my natural introversion and actually go out sometimes to see friends and family instead of merely maintaining relationship with them over social media. It is…not, but try to believe it is! Happy 2016, dear readers. di doman non c’e certezza. Update: Ok, I just finished the afore-linked Tim Parks book and it includes his translation of the bit of poetry above. His translation is, obviously, better than mine. Here it is: How fine youth is/Though it flee away/Let he who wishes, enjoy/Nothing’s certain tomorrow. …for the coming new year (and for any time, come to think of it). It is from the pen (or perhaps typewriter) of Doris Lessing.